A giant catfish is frightening tourists at a Centerparcs holiday park in Holland. The 2.3 metre European catfish eats two or three ducks a day and has even taken a few small dogs, reports Hetlaatste News. 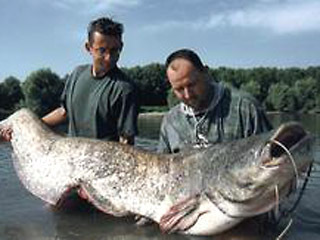 Dutch divers reckon ‘Big Mama’, in the lake of a Centerparcs at Kempervennen, could be the world’s biggest. Remco Visser, head of a Dutch diving school which uses the lake for practice dives, said the fish had scared a number of divers. Centerparcs guards patrol the lake to keep away fishermen who have been trying to climb over the fences at night to catch Big Mama. LAKE LURE, N.C. – Thanks, but no thanks. Donald P. Cook, who won HGTV’s 5,700-square-foot Dream Home in April, says he’s selling the house. The annual $19,396 tax bill plus maintenance costs are too much for the state auditor from Alum Creek, W.Va.
Cook plans to live in the house near Asheville, N.C., for a few weeks then sell it.